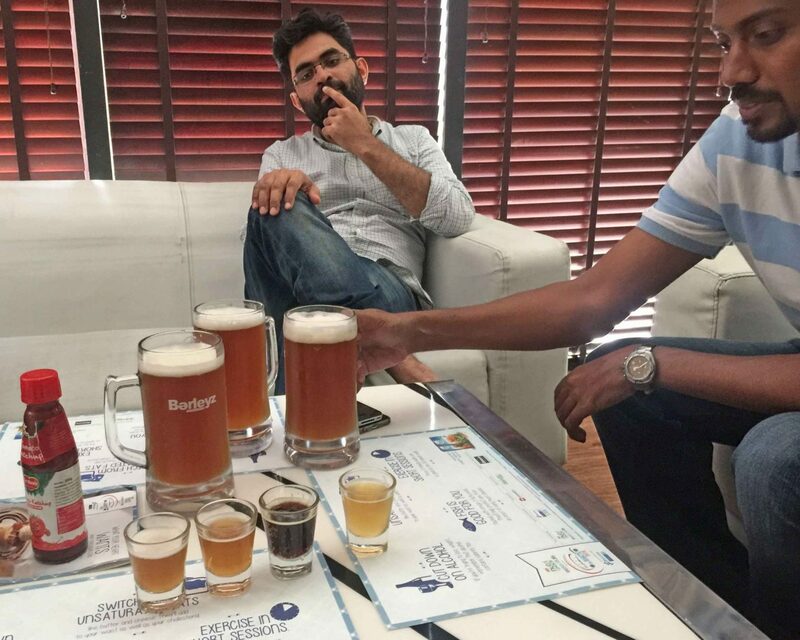 Do India’s Craft Ales Pale vs. US Craft Brews? India is an amazing place to be, and I was lucky enough to be amazed and a bit overwhelmed by this beautiful country for about a week this winter. My paying job took me to Bangalore – a (still) growing city in the center of southern India – also one of the the centers of tech start ups. Where there are tech start ups there are usually young people with some money – and where there is that – there is usually some pretty good fresh craft beer. Bangalore proved to be no exception. Thanks to my like minded beer appreciating hosts I was lucky enough to go to eight venues that brewed their own beer in Bangalore during my visit- though there are even a few more I didn’t have time to get to. Yes, that’s a lot of brewing in one Indian town, but there’s a lot of a lot of things in India! When you realize that the country is about a third of the size of the US, but has about 4 times as many people, you get the idea. Just a dozen years ago, Bangalore (also called Bengaluru) was smaller town, but then the tech boom hit and it’s been growing ever since. Bangalore is now the 3rd largest city in India with a total of over 10 million people, seeing huge growth between 2001 to 2011 – it grew by 3.3 million people (that’s more than two Philadelphia’s alone). Like much of urban India, it’s infrastructure – originally installed by British occupiers some eighty years ago, has in no way kept up with it’s population. And after 50 years of neglect and only seemingly random updates, the fabric of the city is literally bursting at it’s seams. The breweries, brewing restaurants and pubs attract a generally local young middle to upper middle class crowd, and all seem to do good business at night, though are pretty quiet during the day. Of the eight brewing establishments I had the pleasure to patronize – one stood out, as it was a clear copy of today’s large US brewpub. It turned out to be an offshoot of a Michigan brewery called “Arbor”, and going there was like going home for me. I will detail that experience in another article to be published. 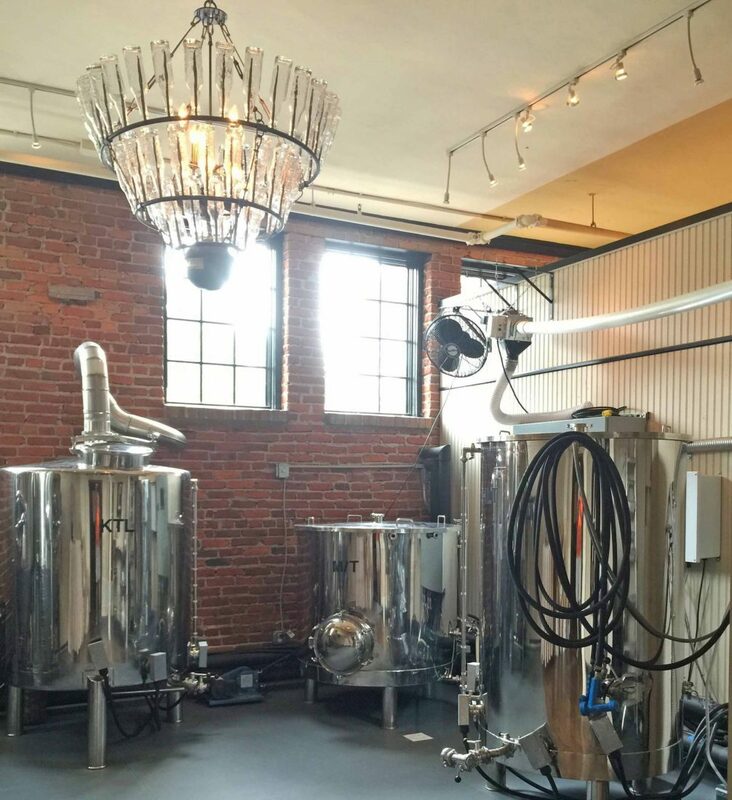 The other seven locations can be divided roughly into two groups – those that are truly food focused restaurants that happen to brew their own beer, and those that are beer focused and lead with the beer experience. The attention to detail around the architecture, design and focus on “the experience” in many of these pubs was obvious unlike many of their US brethren – some of which are warehouse like experiences. Many of the “about us” sections of the websites of Bangalore’s brewing establishments emphasize their architecture and design, with some even naming their architect. 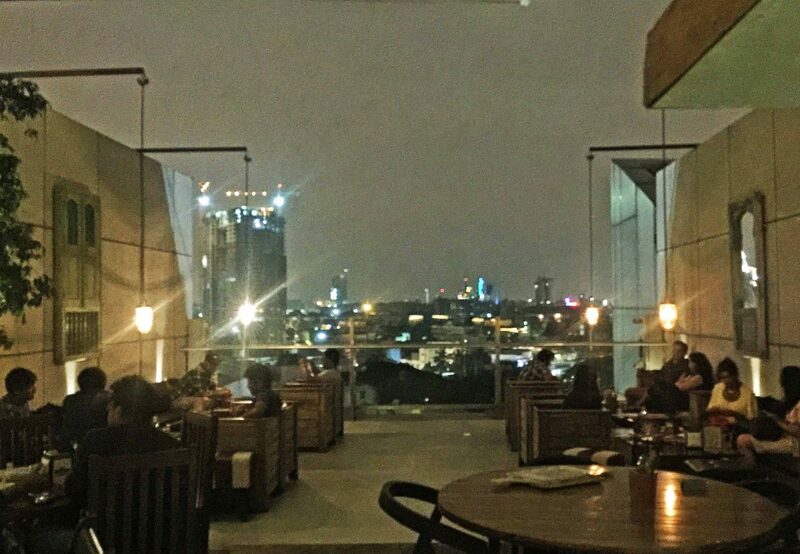 Many places featured a roof top experience – allowing for cool breezes and cigarette smoking. (In early December it was in the 70’s and 80’s – which by coincidence were the years of most of the US rock music playing in the background). Which beer to choose at Barleyz? 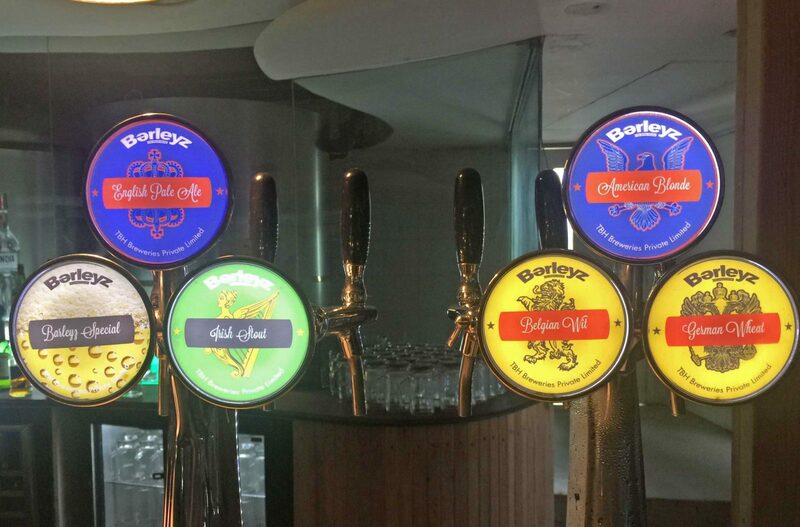 “Barleyz” was one of the first brew pubs in Bangalore, and offered several distinct floors and experiences – one a stylish bar, another a rooftop beer garden – boasting 30,000 square feet in total. This pub, like a number of them, offers 3 or 4 regular repeating styles and one seasonal or special style. When I visited they offered a Blonde, Hefeweizen, Porter and “Ale” style, plus a specialty. A number of the food first establishments offered pretty much this same menu of beer – with the Hefeweizen being a very popular selection. The specialty brew when I visited Barleyz was an ale made with jaggery (raw) sugar, and I enjoyed it. All of the beers were fresh and clean, but also had a characteristic that I soon began to recognize across most all of the local brewing establishments – a characteristic of malty fruitiness and subdued hoppiness. Generally the ales, lagers and the like all had it – almost like someone added a dollop of orange juice to the beer just before serving. This pervasive characteristic may have been purposefully at the direction of the brewers – or perhaps it’s the preferred flavor of the locals. It’s my thought that the malty sweetness works better with their delightful spicy savory food. Or maybe they don’t like hops. More research is needed! Upscale at the brew pub! “Punjabi by Nature” offered a more Euro experience at first look, replete with a “wall of water” design feature and clear glass partitions with stainless steel accents. Again, they offered four of the standard styles along with a “special”, but Punjabi was clearly food focused – and the food was spectacular. The special chicken kastoori kabab was one of the finest things I have ever tasted. The beer was fine, though again a bit grainy and malty – I tried the “German Lager” and it was cloudy and barely discernible from the Pale Ale (which was not very pale). Tasted fine with the kastoori kabab though, so why complain? 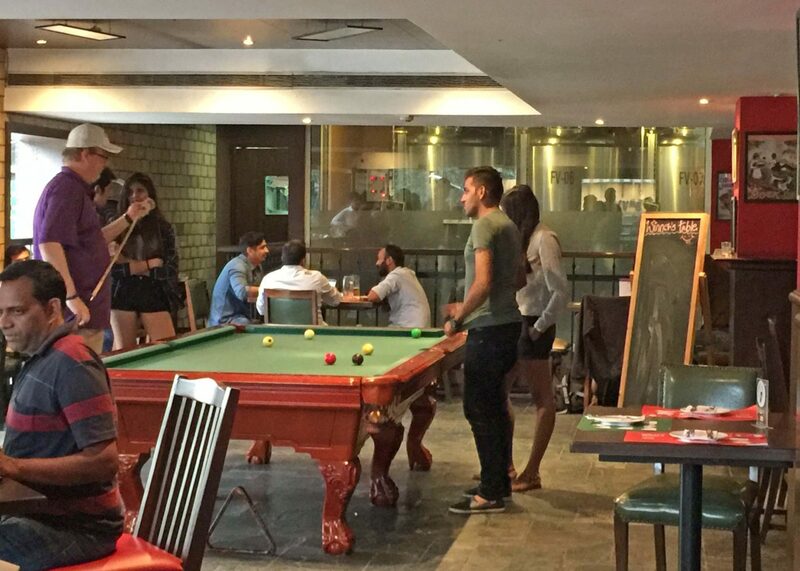 “Bangalore Brew Works” opened just this year, and was clearly going for the upscale dining and drinking experience. Located on the 10th floor of a downtown office building the place was chicly appointed and included an olympic swimming pool (!) 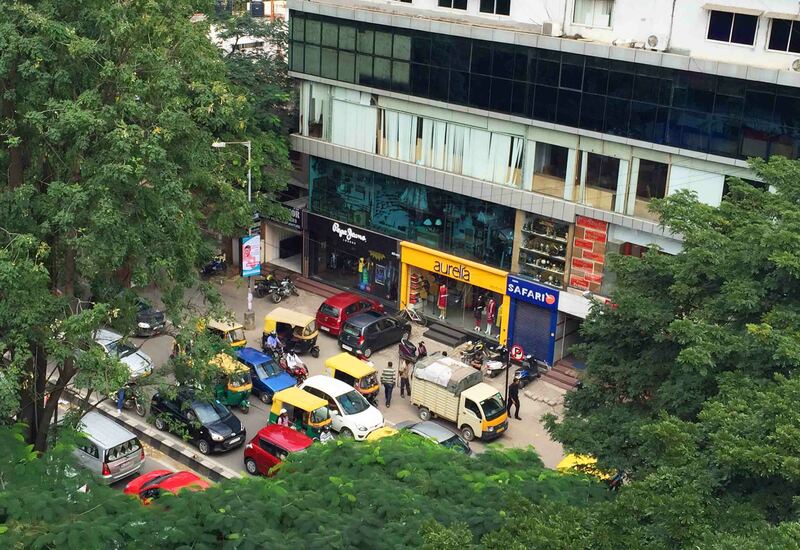 along with a sweeping view of downtown Bangalore. While the beer was a featured item, the view and the design had the feel of a penthouse visit. The beer was again solid with the basic styles all good, though consistent in the malty nature that is the vernacular. The remaining four brew focused venues reflected more of what I had come to expect from a craft beer focused experience. 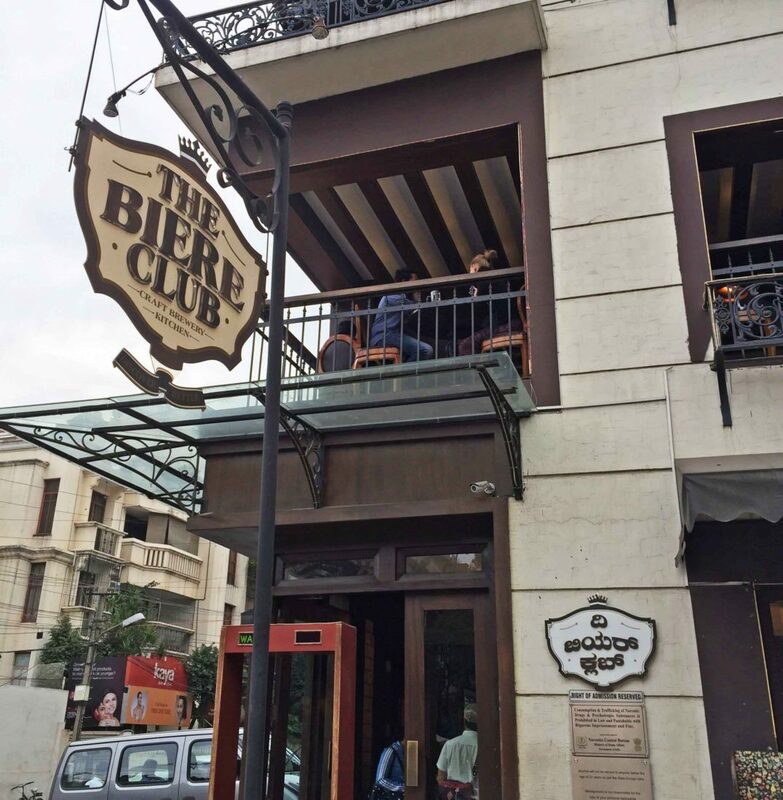 “The Biere Club” went out of it’s way to emphasize beer and it’s dedication to the passion that is tradition of craft beer. It’s decor is clearly british/euro pub (with pool tables) and beer styles were more plentiful. 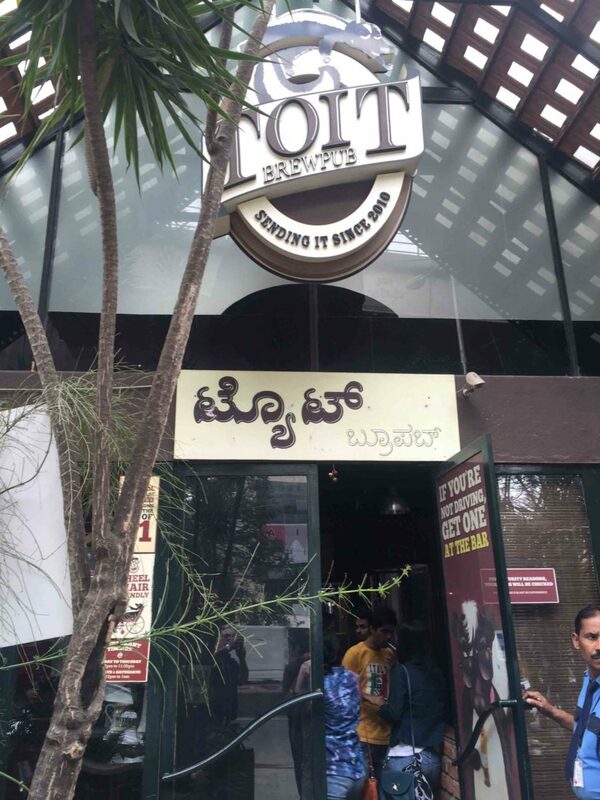 On it’s website it explains “We’re Bangalore’s first craft brewery…established with the purpose of giving beer its due in our country.” And that they do – I enjoyed some clear and clean brews, and IPA that had more of that familiar hoppy bite. Sitting upstairs with a nice view looking down on the upscale city neighborhood though it’s large open windows, I could have been in Philadelphia’s art museum area. “The Prost” brewpub was established in 2013 – making it one of the early ones on the scene and offered a very attractive visual experience with old wood, pipes and flat TV screens showing the most recent cricket or field hockey matches. The day I was there, the beer was not remarkable, and though the special was called an IPA it offered just a hint of hops, and in the case of this visit most of their brews had an unexpected sourness at the finish. 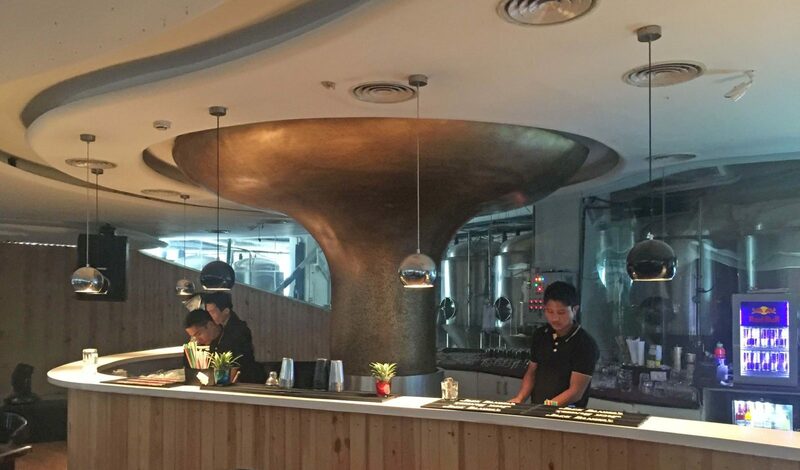 “Toit” was a huge visually impressive multi-floored brew pub place with a old copper 7 bbl system in the center of the first floor – in constant use from what I could see. With at least three expansive floors with an open center to the ceiling, it offered beer, mixed drinks, and full food menu. One of the higher floors offered a family friendly atmosphere. They called their IPA “Colonialist” which was interesting, as their menu faithfully explained the popular story of the naming of the IPA style – without reference to the obvious related issue of being colonized by uninvited British. 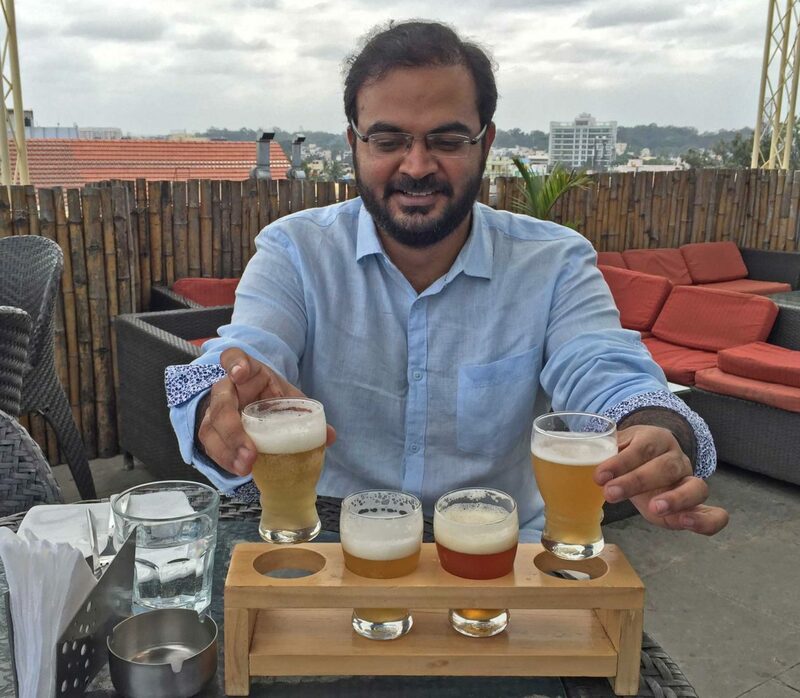 Finally, I had a wonderful afternoon visit to “Vapour” – another rooftop brew pub – with 360 degree view of downtown Bangalore. The food here was outstanding – and the view and visual experience wonderful. At eye level with the soaring hawks and vultures, with a delightful breeze, the beers were good and tasty food specialties like their fabulous Galouti Kebab and Kakori Kebab – made for a great place to talk and drink and relax. Their “premium ale” was a slightly amber sparkling brew with some noticeable bitterness, a nice alternative to the city’s typical malty brews. They also featured a basmati rice beer – which was light and thirst quenching and refers back to old traditions of Indian brewing of rice beer hundreds of years before the europeans brought their recipes to India. So, what did I learn from this brief Indian beer experience? One thing was that it’s obvious that the craft beer movement is global, and the passion for good locally brewed small batch beer is now starting to happen just about everywhere in the world. In India craft beer is also often associated with the good life – and in come cases the best life – with a sense of luxury and high class living. 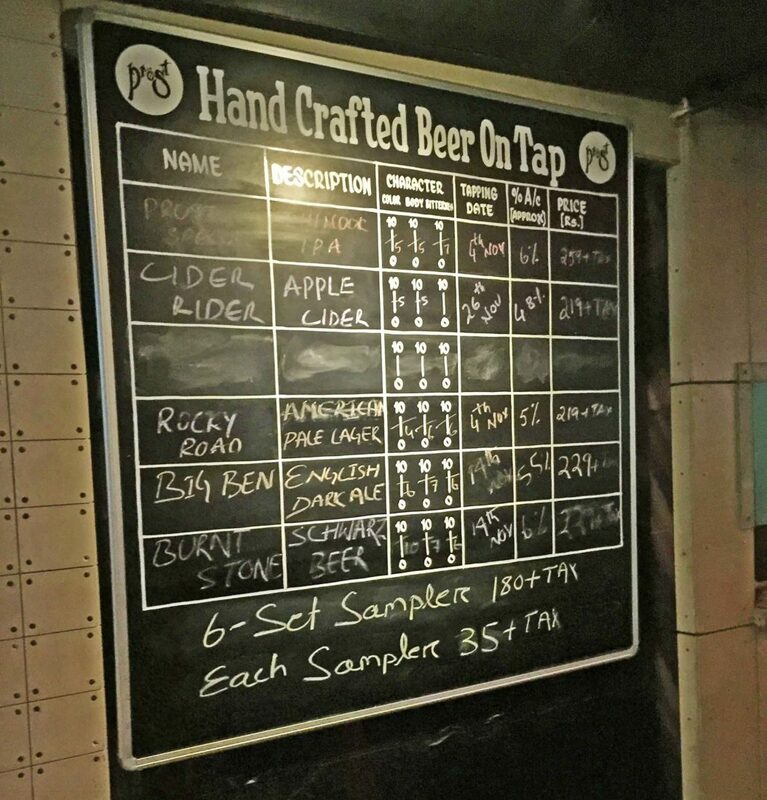 As far as the relative lack of diversity of styles and that typical malty fruitiness – can you remember US brew pubs in the late 80’s and early 90’s? It also took a while for their styles to really develop as well. While India may be a little late to the craft beer game, and it takes a little while to learn how to really get it right. And with added distractions like fabulous food, exotic architecture and the high class experience, the beer recipes are not yet the primary focus of most of the brewing venues. But, like in many other things India is starting late but learning fast. I am willing to bet that in 3 to 5 years Indian craft beer will be second to none. They have the passion and the will, and so its just a matter of time – which is good news for beer appreciators all over the world.